An Oldie But Goodie By Vincent Laforet! Bemis Building Artist Ethan Stern Makes Glasswork Count. Yesterday was Seattle’s Bemis Building’s Spring Art Opening, and dozens of artists with studios and living spaces in the building opened up their spaces for touring visitors. 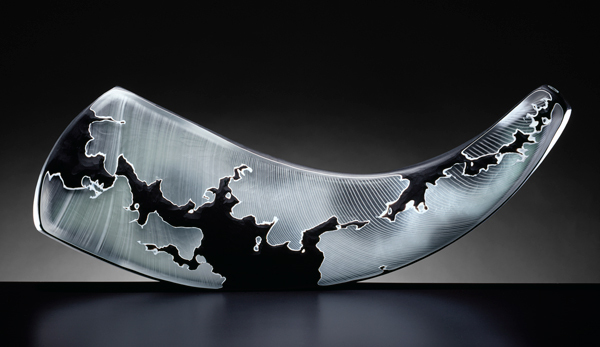 Glass artist Ethan Stern was one of those artists. Despite having a slightly out-of-the-way gallery, Stern creates work that is instantly compelling. It is some of the most exciting art in the building, and frankly, some of the most inventive and technical glasswork I’ve seen in the Seattle area for quite some time. Stern’s work, including the pieces above, undergo a vigorous creation process from start to finish. First, he puts layer upon layer of colored glass to create unique, hollow shapes. The outermost colored layer is then delicately cut away in a cold shop, with various diamond and stone wheels. The process of cutting away portions of the outer layer reveal additional hidden colors and patterns underneath. And while every piece has a pre-determined concept, they evolve naturally through the process of cutting; the above pieces, for example, are meant to be reminiscent of maps and coastlines. Stern, a former ceramics artist, leaves these glassworks in a semi-polished state to give the pieces a more pleasing-to-the-touch feeling of richness.